Leo EagleSpeaker competes in the men’s dance. Gabrielle Bennally dances with her doll in tow. Irene Bailey wraps herself with her pink fancy shawl while in the arena waiting for the results of the princess competition. 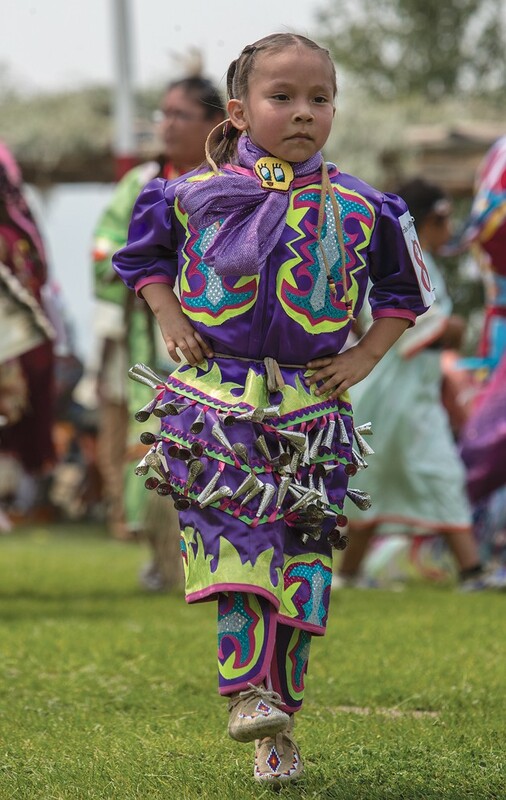 Nevaeh Mercabo dances with gusto in a jingle dress. 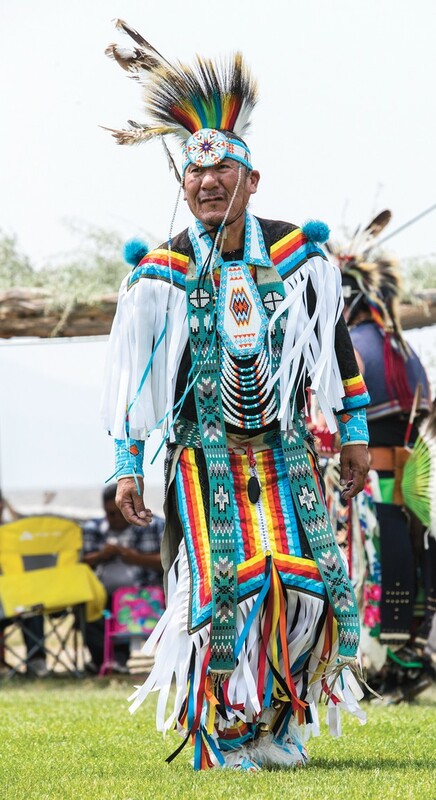 Pow Wow dancer Herman Begay at traveled from Dulce, New Mexico to participate in the annual event held at the Goshute Reservation. Patricia Bennally takes part in the women’s fancy shawl dance. The traditional eagle staff is carried into the Grand Entry with the American flag and the Goshute Tribal flag. 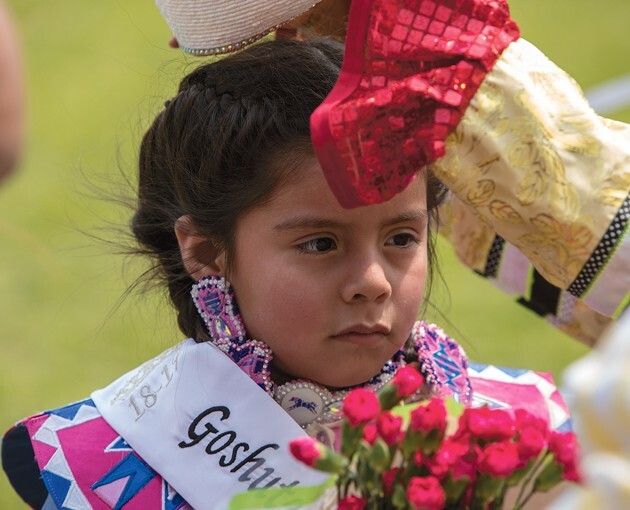 Tatem Steele is crowned Goshute Junior Princess at the pow wow. 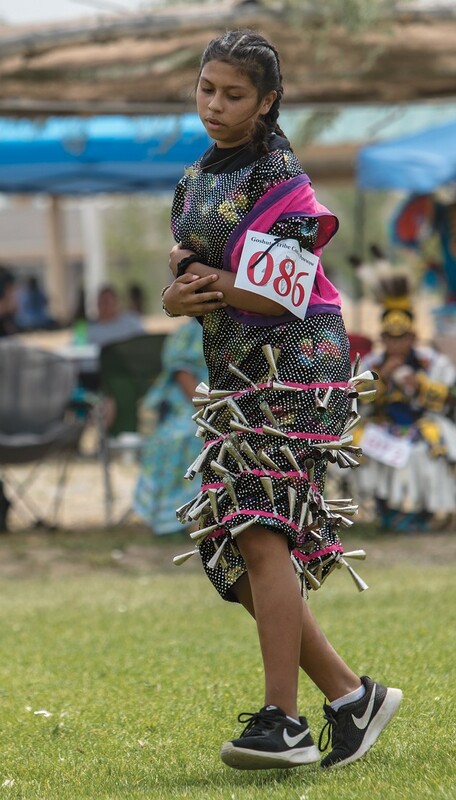 Tooele’s Demi Rea Meastas dances wearing a traditional jingle dress in the princess competition. Cassie Weed enters the arena to take part in the women’s dance. 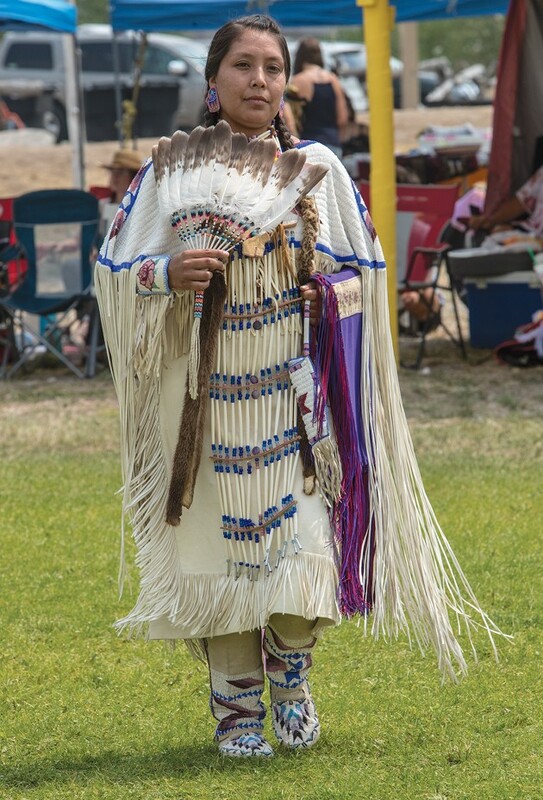 Logan’s Kyra John delivered speeches, danced, sang and socialized at pow wows throughout the intermountain area as queen of the Confederated Tribes of Goshutes during 2017-2018. 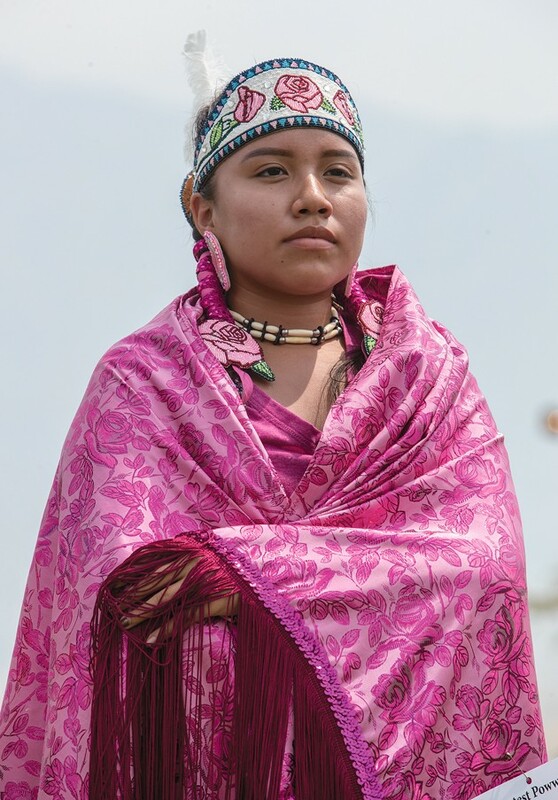 She concluded her duties as queen at a pow wow Aug. 3-5 on the Goshute Reservation in Ibapah. 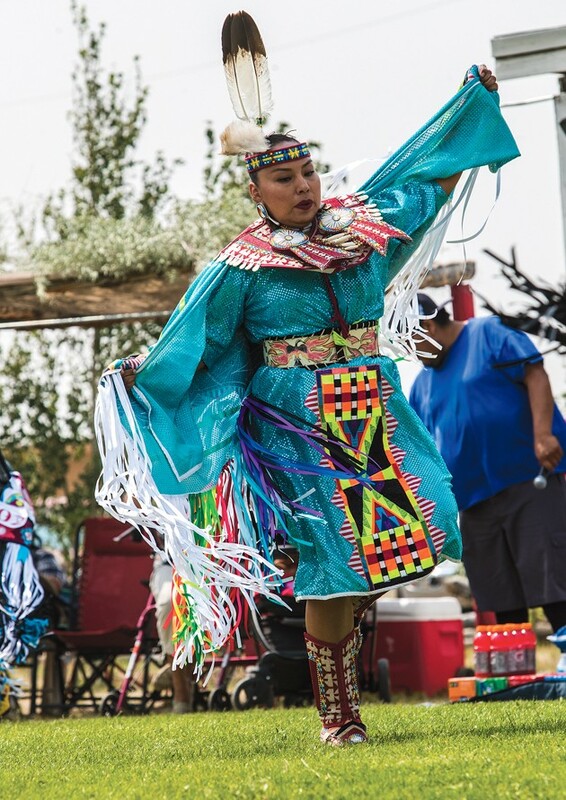 “Pow wows help us keep our traditions alive.There are a lot of pow wows throughout the year in Utah, Idaho, Wyoming, Nevada and throughout the nation. Several tribes are represented at pow wows. Actually, I’m Navajo and Cherokee,” John said. Pow wows include drum circles and men and women in colorful costumes dancing and singing to the rhythm provided by those drum circles. There are vendors outside the entertainment area selling a variety of food items. 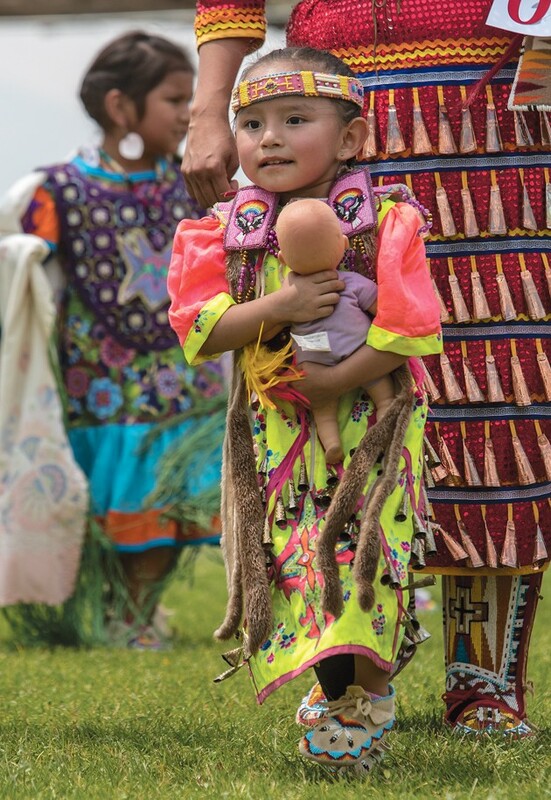 Free snow cones are a tradition at the annual pow wow in Ibapah. 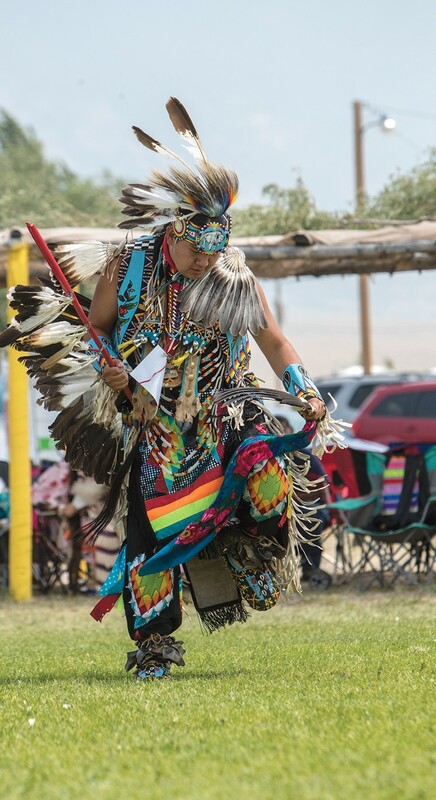 The colorful clothing, music and festivities were on full display at the most recent Goshute pow wow this month in Ibapah. The Goshute reservation includes approximately 112,870 acres in Tooele and Juab counties and in White Pine County, Nevada. 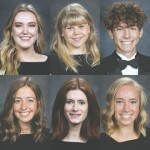 Its headquarters, Ibapah, is in the far southwestern corner of Tooele County — about a three-hour drive from Tooele City. On the morning of Aug. 4, temporary shelters surrounded an open circular grass area for the dancers to display their skills. 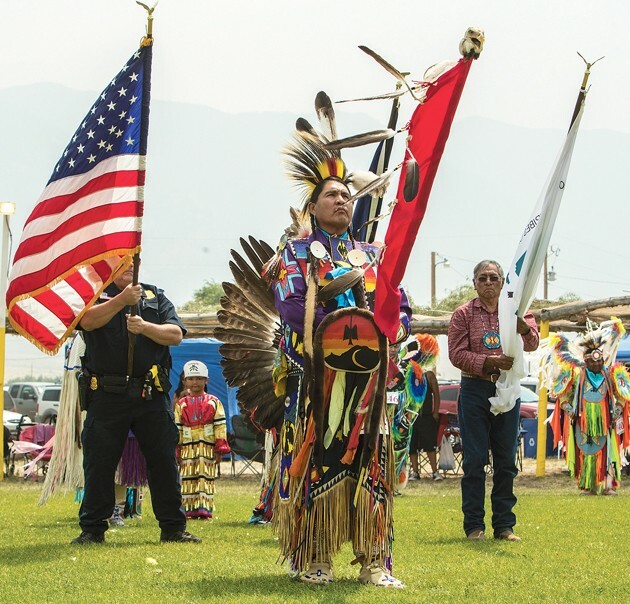 The event started with a flag ceremony that featured the Native American Flag of our First Nation carried by Gabe Hardin, United States Flag carried by Jeff Jones, State of Utah Flag carried by Lee Moon and Goshute Flag carried by Goshute Reservation Chairman Rupert Steele. Announcer Jerry Bear described the events to those at the pow wow from a stand set up in front of the dance area. Five separate drum circles took turns providing the music. They competed for a top prize at the pow wow. Judges selected a new queen, princess and junior princess. Tooele’s Demi Rae Maestas, who will be a student at Clarke N. Johnsen Junior High School this year, competed in the princess competition for the first time. 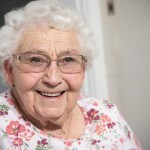 “I was totally unprepared and didn’t have my pretty dress and had never danced before. But I thought about my aunt who always told me to just get out there and don’t doubt yourself. 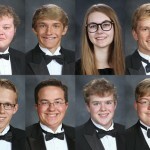 So I decided at the last minute to do it,” Maestas said. She finished in second place in the princess competition. “I’ve always loved coming out here and watching the dancers. 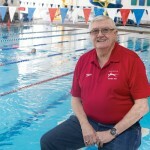 It’s part of our culture — we’re all like family,” Maestas said.